Panini now finds itself involved in a second heavy metal battle. First, Topps picked a fight with it over Panini's "Chromium" trademarks. Now, Panini, along with Kevin Durant and Nike, finds themselves on the receiving end of a lawsuit from guitarist Mark Durante (from bands such as Public Enemy, The Aliens, The Next Big Thing, The Slammin' Watusis, KMFDM and The Waco Brothers) over the term "Durantula." Legal side note: Yeah, I have to admit it, I like KMFDM. And I'm going to need to check out the Waco Brothers. According to the complaint, Durante (not to be confused with Durant, although, being this is a trademark case, that's the point) adopted the name "Durantula" for his on-stage persona in the late 1980s and has used it continually since. This includes the last 10 years on his website durantula.com. Other Data The name(s), portrait(s), and/or signature(s) shown in the mark does not identify a particular living individual. "Kevin Durant never authorized any company or media outlet the use of the term 'Durantula'" and that "Kevin not use the term as a nickname and no intention of doing so." According to the complaint, despite these reassurances, the name "Durantula" has continued to be used with Kevin Durant, has caused confusion, and therefore, Durante is left with no choice but to bring suit. Specific to Panini (this is Law of Cards after all), Durante is concerned about "an autographed Durantula basketball for sale by co-defendant Panini America, Inc….through Durant's website" and "an autographed 'Durantula vs. Mamba' signed photograph also for sale by Panini and accessible through Durant's website." Now, in regards to Panini, this is a smaller lawsuit, so I'd expect them to settle rather quickly. 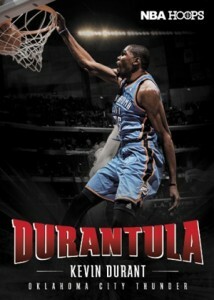 It may lead to Panini having to squash a planned Kevin Durant short print for 2012-13 NBA Hoops that had the Durantula nickname. I would also expect Durant to settle it too especially if he does not want to be known as the "Durantula" which, when it comes to basketball, is an odd nickname. And this letter seems to confirm, Durant wants nothing to do with this nickname. But hey, this lawsuit may coin a new nickname for Durant: The Artist Formerly Known as Durantula. 100% AUTHENTIC Warriors Mens Large Kevin Durant Blue Nike Basketball Jersey. Lame nickname and I dont blame Durant for not wanting it. No kidding…and now that he’s losing that one, what’s next? Durantelope? Duranteater? The bad possibilites (unfortunately) are endless. Not to mention the obvious (given he is a defendant in a lawsuit): Dur-defend-ant. KEVIN DURANT 2014 PANINI PARAMOUNT PENMANSHIP AUTO AUTOGRAPH CARD #26 35!